This postcard is postmarked 1906. When I visited The area in 1987 Poyntzfield House was a resturant/ My mother Isabel Mackay worked in the Gardens there for more than a decade The house was owned by Mr & Mrs Hawker. It was a funny house a bit spooky lots of long dark corridors with a full size suit of armour standing in one. I shiver thinking about it now. 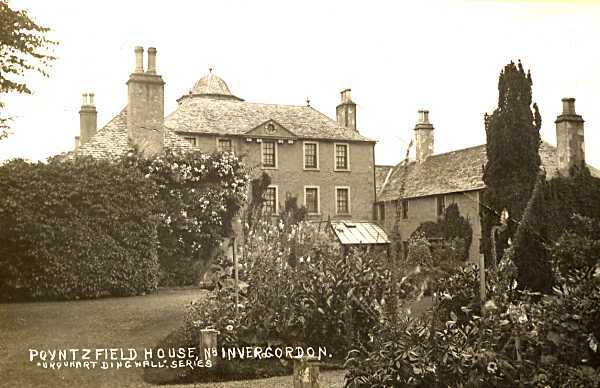 My mother Annie Macdonald was a maid in Poyntzfield House and worked for the Munros who owned the house, farm and gardens until 1936 when they lost all their money with the Railways in Canada. I remember there were 2 sons both army officers. Both had MG sports cars and a chauffeur who drove a Daimler for the parents. Certainly were the gentry of the time. My grandfather was their farm manager and my Granny did baking for the big house. My mother and father met here and thereafter went to Alness where my father ended up as a wood merchant. I certainly remember the ghosts! I stayed there one summer holiday in 1968 and maybe one more time. '68 sticks in my mind because it was at Poyntzfield that we heard the news of the Russian tanks going into Prague. Loved the house and the dilapidated harpsichord in the large drawing-room. Such a great house to explore when you're 14! I am curious regarding any stories about ghosts - we had a family holiday there in 2004 and my 2.5 year old son said he'd been speaking to a girl with a dress and a hat (when described it sounded like a bonnet) who had sat at the window ledge of his room. For ages afterwards he referred to that house as Lily's house. Twice during the week members of the family were going up the main staircase, and heard one of us behind them so turned to say something...but when they turned nobody was there! Still a great house and grounds - would go back. Hope Lily doesn't visit me though! The stairs were often full of noises of children going up and down. I never encountered Lily, but in the room where I slept I saw an old lady, dressed in deep mourning, looking down at me. Oddly enough, I wasn't scared so much as intrigued - and a little sad as well. The scarier place, for me, was a downstairs corridor, (linking one of the 'wings' to the main part of the house, if memory serves) which I avoided if I possibly could. Not a nice feeling there at all! Please does anyone know if there were 'evacuee children' living here during WW2 - either in the House itself, or the adjacent properties. If so, does anyone remember any of them - or a large black & white shire horse, who was a favourite of one child who stayed here sometime between 1936 - 1946? My grandfather Harold lived at Blinkbonny Cottage on the neighbouring Udale estate. When visiting as a teenager in the early 1980s I remember being told that Pontzyfield House was owned by an old film star? Also there was a ghost of a 'Grey Lady who was seen by the local children on the farm as she wandered up the track. The couple who lived there when I visited as a child were Geoffrey Cunliffe, who was managing director of British Aluminium. His wife had indeed been an actress, under the name Barbara Waring. There was also the story of the 'phantom piper' im the dome at the top of the house, who was said to play before there was a death in the house. Luckily, I never heard him!